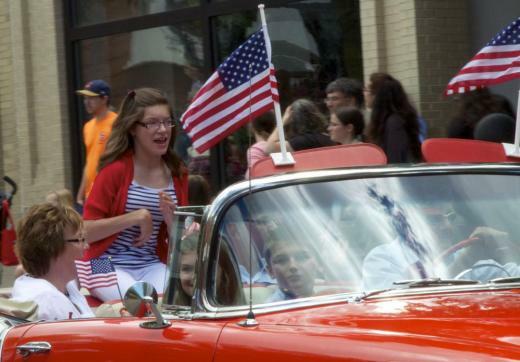 Ellie Ritzman of Millerstown was honored as hero of Central Pennsylvania in Friday's parade of heroes. Ellie has cerebral palsy and has been at the center of annual bake sale that raised over $11 thousand for the Children's Miracle Network last year. Back on April 22, she looked out a different scene beside a State College road: a man who had crashed his car after going into cardiac arrest while driving. Karduck, a registered nurse from Boalsburg, “made an immediate gut decision” and performed CPR on Bryan Musser of Centre Hall – ultimately saving his life. Though Karduck hadn’t thought of herself as a hero, she found herself nominated to be honored in this year’s parade. For the past three years, the parade has paid tribute to unspoken heroes from around the state. Some heroes, like Ellie Ritzman of Millerstown, were honored for the inspiration they bring to others. Ellie, a young girl with a gentle smile, was born with the neuromuscular condition cerebral palsy, which requires her to use a computer to help coordinate her muscles. After watching Ellie’s strength in battling her condition, her parents, Derek and Diana Ritzman, started Ellie’s Bake Sale to raise money for the Children’s Miracle Network. In the bake sale’s seventh and most recent year, Derek Ritzman says Ellie helped raise over $11,000 to benefit the Janet Weis Children’s Hospital in Danville. As the parade progressed through downtown State College, Ellie glowed with joy and smiled at the gathered crowds. Randy Murphy of State College came out to watch the parade and support those being honored by their community. He says he wasn’t sure what to expect, and was impressed by the number of participants in the parade. In addition to the community heroes being honored, dance and cheerleading companies, baton corps, roller derby teams, horses, pageant queens and fire trucks paraded through downtown State College, tossing candy to the excited crowds of families lined along the streets. Jeff Martin of the Alpha Volunteer Fire Company says its important to honor the heroes in one’s community, but was surprised to learn that the entire Alpha fire company had been nominated. Bob Timulak drove from Somerset County to celebrate Independence Day at 4th Fest for the first time. He says “a hero is someone who goes above and beyond to help their fellow man,” regardless of their background or profession. Karduck says she takes pride knowing that she made a difference in someone’s life, but insists she only did what anyone would have done in that situation. “Anyone can do it,” she says.